Average Height	: 21" - 26"
Average Weight	: 55 - 80 lbs. In the winter of 1807, an English ship with two Newfoundlands on board wrecked off the coast of Maryland. Everyone was saved, and the two dogs were given to a family of dog lovers. They were later mated with local retrievers including English Otter Hounds, Flat-Coated Retrievers and Curly-Coated Retrievers. Careful breeding over the years has created an outstanding retriever with incredible enthusiasm and endurance. The Chesapeake is one of the few breeds that were developed in the USA. The dogs were used to hunt waterfowl, ducks, in the rough and icy waters of the Chesapeake Bay. The Chesapeake Bay Retriever has been known to retrieve hundreds of birds in a single day in frigid waters. This lively, enthusiastic hunter will come out of a river or marsh with only a few drops of water remaining on its oily coat, and these are quickly eliminated with a shake. Water rolls off the dog like a duck. Some of the Chesapeake Bay Retriever's talents include: tracking, hunting, retrieving, guarding, watchdog, Schutzhund, field spots and competitive obedience. Chesapeake's have the distinction of having unusual yellowish or amber-colored eyes. The first American Chesapeake Club was formed in 1918, and the first licensed retriever trials held in 1932. You will find a pair of cast-iron statues of Chessies at the front door of the Chesapeake Bay Maritime Museum in St. Michael's Maryland. •	Intelligent, bright and happy dispositions. •	Very courageous, alert and strong work ethic. •	Strong-minded, Chessies can be stubborn and require good dog training skills by their owners. •	Require a great deal of exercise ~ swimming if possible. •	Can become destructive if left without mental & physical stimulation. •	Not recommended for a 1st time dog owner. •	Can be more guarded, aggressive and reserved towards strangers than other Retrievers. •	Strong, slow to mature and territorial. •	Do well in both cold & warm climates. •	Can be aggressive with strange dogs, but get along fine with family pets if raised with them. A Chesapeake Bay Retriever is an excellent family dog that is generally very good with children and other pets. It is important to properly socialize this breed as they are more dog-aggressive than other retrievers and can become territorial. They are good watchdogs and have a natural wariness with strangers however regular socialization and exposure to new people and new environments will help prevent this from becoming a problem. Unlike many of the hunting dog breeds the Chesapeake Bay Retriever tends to be much more independent and stubborn than the norm. They can be dominant and are known for their selective hearing of commands they simply wish to ignore. Not a mean spirited dog they just need consistent training and lots of positive praise for a job well done. The Chesapeake Bay Retriever is an excellent dog for obedience training at a young age to establish good behaviours and decrease the tendency for willfulness or independence. The breed maybe somewhat dog-aggressive and should be socialized regularity and throughout their lives. Usually male Chesapeake Bay Retrievers are more dog-aggressive than females and neutering can assist in preventing this issue from developing. They can be excellent companion dogs with socialization and will even get along with non-canine pets in the house. They are prone to chase however and often will really enjoy running the neighbor's cat out of the yard. The Chesapeake Bay Retriever is an intelligent dog that learns best with repetition. They should always be trained using positive rewards and methods as their natural independence will only increase if negative training techniques are used. They are naturals at fetching and swimming and love exercise of all types in almost any kind of weather. They are not a hyperactive dog but do need regular, longer periods of exercise. In the house they are typically very relaxed and calm and will simply find a comfortable place to stay out of the way. They are not demanding of attention but love to be able to keep the family in sight. Since the Chesapeake Bay Retriever is a more independent breed they are able to tolerate moderate amounts of time alone. They are a great dog for a family that has evenings and weekends at home but someone may not be there at all times. Generally not a destructive dog with proper training and exercise they do need to be kept in a yard because of their chasing and dog aggressive tendencies. The Chesapeake Bay Retriever is not recommended as a first dog for families or individuals that have not trained dogs unless they are planning to take the puppy to a socialization and obedience class. Since they are a large dog when fully grown it is important to have them well trained before they reach their mature size. Overall the Chesapeake Bay Retriever is a relatively healthy breed. As with all of the large sized dogs they are somewhat prone to Gastric torsion or Bloat and should have several small meals rather than one large meal. They should not be exercised immediately after eating. The short, dense coat of the Chesapeake Bay Retriever is very easy to maintain. Brushing with a short wire brush or pin brush is all that is required to remove any dead hair and debris. Since the breed has a natural water repelling coat they should only be bathed when necessary to prevent drying the coat and skin. The Chesapeake Bay Retriever requires long, regular exercise to keep focused and avoid getting involved in destructive behaviors. They love to swim and should be allowed to do so as often as possible. One of the amazing features of the oily coat is that once they come out of the water and shake they are damp, but not wet like other dogs. The breed is a natural retriever and will quickly learn games of fetch. Because they are a heavier breed and have some hip and elbow problems Frisbee is not recommended as the jumping and landing action of the game can make joint problems significantly more problematic. The Chesapeake Bay Retriever is a good companion dog for hiking, jogging and traveling. When properly socialized they love to go new places and are considered good in vehicles, although they will take up a lot of space. They should be walked on a lead when other dogs are present but really do need a large yard or area where they are free to run and exercise. The Chesapeake Bay Retriever is an intelligent dog that is methodical and devoted to the family provided they are trained and socialized. The breed is not as fast to learn as some of the other dog breeds and they do require a patient trainer that will provide ample repetition to gain master of the tricks and commands. The Chesapeake Bay Retriever should only be trained by one person until they have mastered the command to prevent them from being confused and possibly detracting from the training experience. They need to be worked using a positive training method and will do very poorly when treated harshly or punished. Typically they are very sensitive to owner's moods and tone of voice and a slight reprimand is all that is necessary to get them to stop a behavior. Socialization at an early age is extremely important with this breed as they will become more dog-aggressive as they age without socialization. Dog aggression is most noted in unaltered males so neutering is highly recommended for dogs. Females that are spayed are also less aggressive and tend to be more focused on people rather than distracted by other dogs. 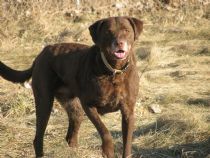 The Chesapeake Bay Retriever is a great dog for children and once trained will follow directions even from young kids. They love to swim and retrieve and will require little training in these areas. It is always important to completely exercise this breed before training sessions as they can be somewhat independent and stubborn or distracted when not properly exercised. If you wish to house this breed with other pets including cats it is very important to work with the dog at the earliest possible stages in acceptance of other pets. They can be very good in a house with cats but are less recommended for houses with other small animals. Training should begin when the Chesapeake Bay Retriever is a puppy, ensuring that the cat and the puppy get along well. The natural independence and dominance of the breed makes it more difficult to train than other retrievers. Owners must positively and gently assert that they are the boss or this large dog will try to dominant the family. They also have an aloof presentation around strangers and should be introduced to lots of new people throughout their life to prevent them from becoming overly protective or possessive of their territory. Although not recommended for first time dog owners the breed can easily be trained through use of a professional trainer or obedience class provided the owners are willing to practice and follow through with the lessons.